Competitive pressure in JetBlue’s Latin American and Caribbean markets has led to a revision of the airline’s ROIC targets for 2014, which will result in the second consecutive year that the company has missed its stated goals in that metric. The airline is taking the long view with respect to the industry capacity additions in its international markets that have historically been a point of strength in JetBlue’s network, and believes Latin American and the Caribbean remain key to its network diversification strategy. On a broader scale, JetBlue faces the same challenges going forward that it has encountered for the better part of a year – making investments that seem to take longer to generate returns than investors would prefer. Even as the airline prepares for an executive leadership change, investor impatience remains strong. 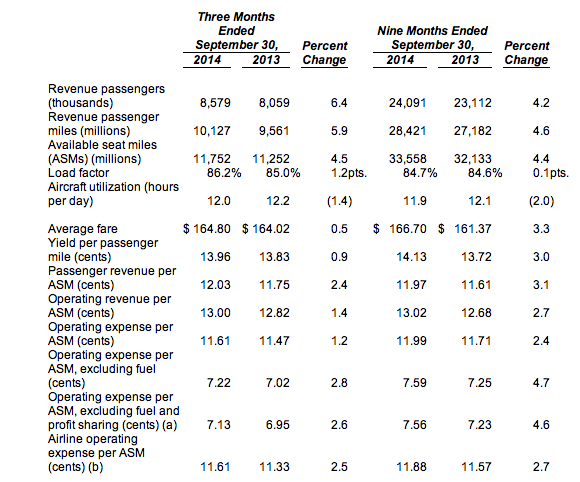 JetBlue’s average fare during 3Q2014 increased just 0.5% year-on-year, which resulted in yield growth of 0.9%. Passenger unit revenue increased 2.4% and load factor grew 1.2ppt to 86%. Mr Powers estimated that JetBlue increased its ASMs to the Caribbean and Latin America during 3Q2014 by 17% as competitive capacity in those markets grew 7%. At the end of 2Q2014, American Airlines remarked that certain pockets of the Caribbean were recording significant capacity growth year-on-year, with industry supply in Cancun and Montego Bay up 25%. JetBlue estimates that in 3Q2014 approximately 32% of its ASMs were deployed into Latin America and the Caribbean with the remaining 68% placed in the domestic market. JetBlue president Robin Hayes explained that JetBlue’s challenges in the Caribbean and Latin America during the quarter were not driven by load factor (evidenced by its increase year-on-year), but in fares due to the capacity additions that “put close-in pressure on average fares”. Mr Hayes stated that “all the airlines share the same fare data and so when an area starts to perform well, you do tend to see capacity then go in; when it starts to perform less well, capacity will move”. 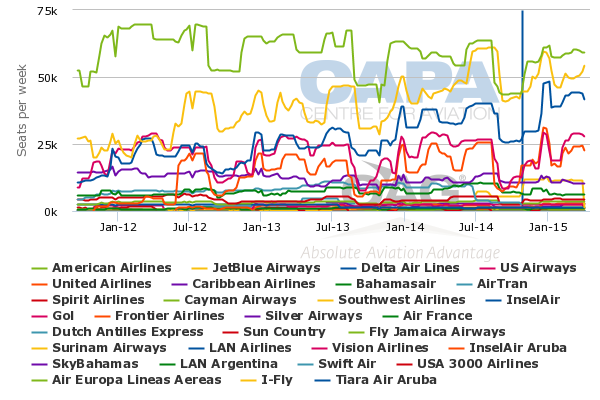 JetBlue’ has significantly more capacity in the Caribbean than Latin America. San Juan in Puerto Rico, is a focus city for the airline. Data from CAPA and OAG show that for the week commencing 27-Oct-2014 total seats between the US and the Caribbean are up 28% year-on-year. JetBlue’s seats on offer have increased 56% year-on-year, followed by Frontier Airlines with 32% growth and Spirit Airlines with a nearly 27% increase. Caribbean Airlines has also increased its seats by 32%. United’s seat counts have jumped 165% year-on-year, Delta’s have risen 28%, American’s 8% and US Airways 23%. It is not certain when competitive capacity will decrease to the Caribbean. United Airlines recently stated that is was planning double digit ASM growth in its Latin American entity in 4Q2014 largely targeted toward beach markets. United remarked that while the additions could create some revenue pressure during 4Q2014, it would be profit maximising for its overall network. United is likely to keep its capacity increases to Latin America intact through the winter season as it cuts trans-Atlantic supply by 3%. JetBlue’s challenge in pleasing investors during the past couple of years has come in part from setting lower return on invested capital (ROIC) targets than its peers, and missing its stated goals. Its plan has been to increase ROIC by 1ppt per year. The airline missed meeting that goal in 2013 as its ROIC increased from 4.8% to 5.3%. Previously the airline has said it would achieve a 7% ROIC for 2014, which would have made up for the smaller than hoped for ROIC improvement in 2013. But JetBlue has now warned that its returns will fall below the 7% mark in 2014 due to challenges in its Caribbean and Latin American markets. JetBlue is estimating approximately USD975 million in capital expenditures during 2014 – USD635 million related to aircraft purchases, USD320 million in non-aircraft expense and USD20 million stemming from the sale of its LiveTV subsidiary. At the same time it will generate negative free cash flow driven by some non-aircraft investments in facilities in Boston and New York and its purchase of slots at Washington National. It is tough to predict when those types of investments will begin to show returns. But the consensus appears to be that the time period is too long for investors. 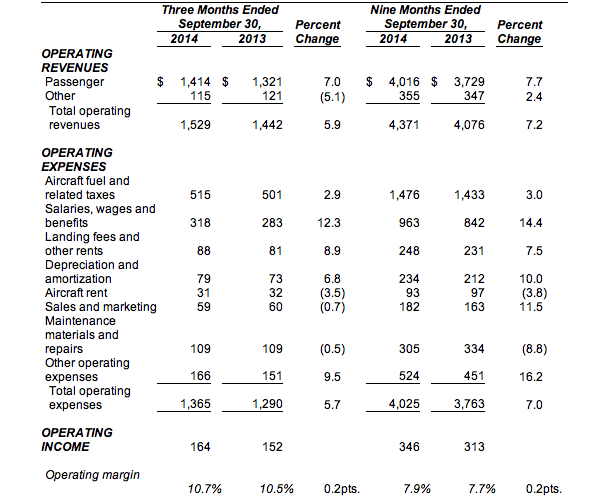 Despite the overhang from competitive capacity pressure in the Caribbean and Latin America, JetBlue grew 3Q2014 top line revenues by nearly 6% to USD1.5 billion as expenses increased 5.7% to USD1.4 billion. The airline’s operating revenue increased from USD152 million to USD164 million year-on-year. One of the main drivers for JetBlue’s cost pressure in 2014 is from a new labour contract it reached with pilots that will cost USD145 million between 2014 and 2016. Previously, JetBlue has estimated that roughly 60% of its unit cost increase in 2014 is attributable to an increase in salaries and benefits. It is not uncommon for airlines to miss certain financial targets that they set for themselves. For example, Southwest Airlines will finally meet and exceed its ROIC goals after missing its self-declared benchmarks during the past couple of years. At almost 15 years old, JetBlue can justifiably say that it remains a young company compared to it US peers, some of whom have had the benefit of Chapter 11 restructuring to wipe away years of legacy inefficiencies. But JetBlue has been a publicly traded company for more than 10 years. With the push in the US airline industry for shareholder returns, the pressure for JetBlue to outline a plan for investor rewards and zero in on how it intends to meet future financial targets will only intensify.